The previous day’s report from Dhuri Junction will be published at a later time, too many photos to edit! 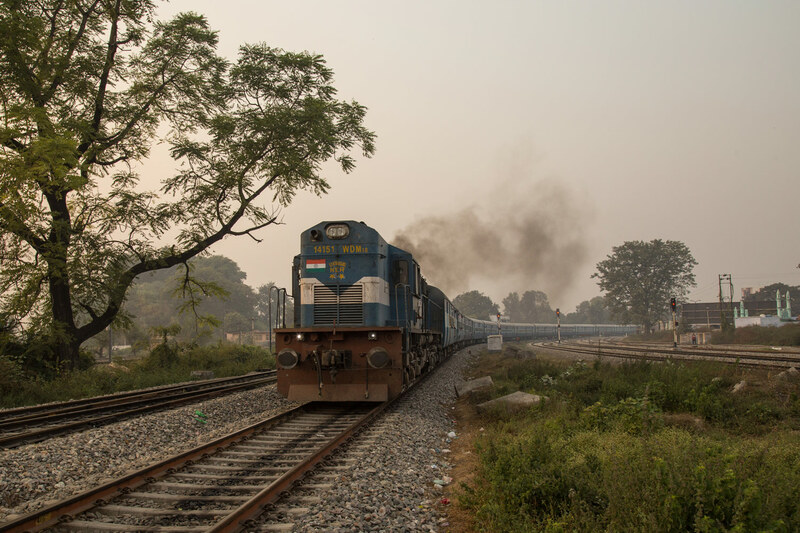 Our plan from Dhuri Junction was to take a convenient overnight train special train directly from Dhuri to either Bareilly or Lucknow depending on if part of the metre gauge had closed for conversion. However it seemed on this even when I did make plans things went just as poorly as when I didn’t, sitting in Pathankot two days prior I found out that the train had been cancelled, so much for our well laid plans. Having checked every other train I found them all totally waitlisted in every class so the best plan I could come up with to reach Bareilly was going back to Delhi on the Ludhiana Shatabdi (12038) and then early the next morning continue north on the Bareilly Express (14556) reaching around 1400. The Bareilly express is a rather slow train because it takes a secondary diesel only line but has the benefit of being hauled by a WDP3A, a first for me. Well the plan worked but it was far more expensive than I had hoped, nearing the end of our day at Dhuri we went to purchase tickets for the Shatabdi to find out no, they couldn’t sell them to us because the chart had already been prepared but maybe we could buy them on the train. The train arrived and the TC did not show any sympathy for a few stupid tourist’s problems and reluctantly said yes we could get on but it would be 2000 rupee penalty fare, I was enraged but having no better plan at the moment we paid the ridiculous overcharge and headed towards Delhi in a rather empty train. After a little bit of roaming we found an of course overpriced hotel and then quickly settled in for bed since tomorrows train was at 0600 from Old Delhi station further away. The next morning came quick and we set out in Rickshaw towards old Delhi, the rubbish filled streets lit by Sulphur lights and the burning trash made it seem like some sort of hellscape amplified by my general tired and continued sickness. We made it to Old Delhi just a few minutes before our trains departure and there was some confusion on which train it was since ours was still bearing the train boards from the rakes previous utilization on the 14554 Amb Andaura. However, we found our names on the charts pasted on the coach soon enough and settled in. Despite being a daytime trip I wisely booked 3AC upper berths so we could sleep as it was a long journey and I knew we would be tired after the short night. I nearly immediately went to sleep and woke up an hour later to find we were STILL sitting on the platform at Old Delhi, its no wonder trains in this segment have such awful on time performance. I slept for most of the trip waking up only as we approached Bareilly. Upon reaching I split up once again with Thomas and Robin, they continued on to Philibit but I really needed to see a doctor as I was almost completely unable to hear in one ear since getting sick and had not been able to treat it with over the counter medicine from the pharmacy. I really should have gotten this taken care of in Himachal where English was common, but no I was in Uttar Pradesh where almost no one speaks English so ended up going in circles around town with several different Rickshaw drivers trying to get them to go places that looked like doctors offices on google maps. Finally, at one place I caught a lucky break running into someone that spoke English, the ear doctor was not in but he knew another one that was open. So after one final rickshaw trip I reached the office the helpful guy had recommended it. I was shocked when asking to see the doctor I was only charged 200 rupees and admitted right away. The problem it turned out was simple….just A LOT of ear wax build up which he quickly scooped out and I was able to hear and feel like a normal human again. 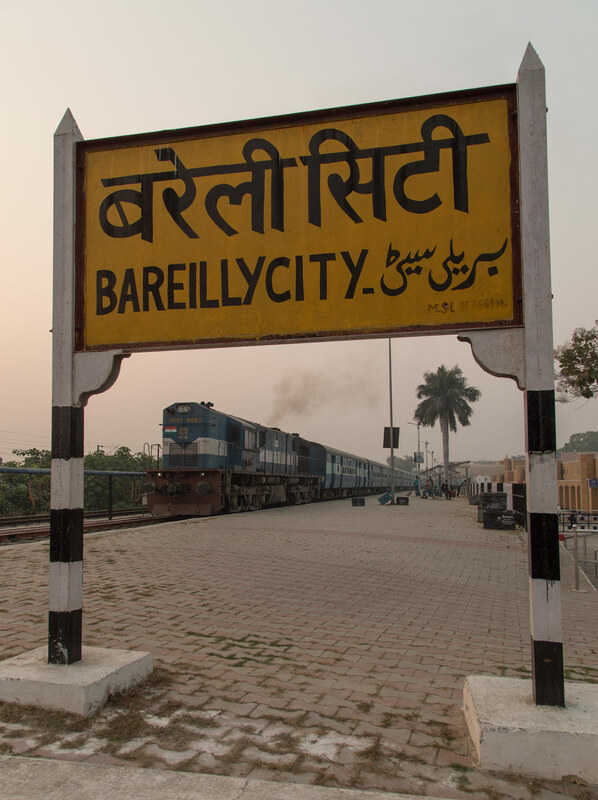 Feeling a lot happier I headed to Bareilly City station, the former metre gauge station in Bareilly. Sadly today the metre gauge is all gone from Bareilly, replaced with a very sterile and generic broad gauge station which for now only has a few local unreserved trains. The next train to Philibit was not until 18:00 so I had plenty of time to wander around the not all that interesting station and photograph the few arrivals and departures which were atleast still all ALCO hauled by Izzatnagar sheds small fleet of modern WDM3Ds. Below (Row 1): Two IZN WDM3D’s including a transfer still wearing the Gonda paint scheme are stabled at Bareilly City. Second Row (left): The 55358 the Bareilly City to Kasanj passenger departs. Right: The Bareilly to Lalkuan passenger 55351 departs in the growing darkness. Below: 55368 (Pilibhit to Bareilly passenger) arrives at Bareilly City behind a rare WDM3B locomotive, only 23 of these locomotives were built and most have been reclassed as WDM3Ds. This stock would make up my train to Pilibhit. Finally as dusk was falling it was time to go to Philibit aboard 55367, the trip was all in the dark and devoid of scenery but the cracking sharp WDM3A exhaust was absolutely musical with my post ear cleaning supersonic hearing. Meanwhile Thomas and Robin were having a hard time finding a hotel in Philibit but I was able to give them a suggestion I had gotten from fellow rail enthusiast from the UK Vic L. Philibit of all places was one of the first places I saw that had completely embraced the E-Rickshaw and phased out the standard petrol ones. After a short Rickshaw ride where the drivers were annoyed by my lack of Hindi I arrived to find Thomas in the lobby having just finished filling out his mountain of paperwork customary of staying anywhere in India.